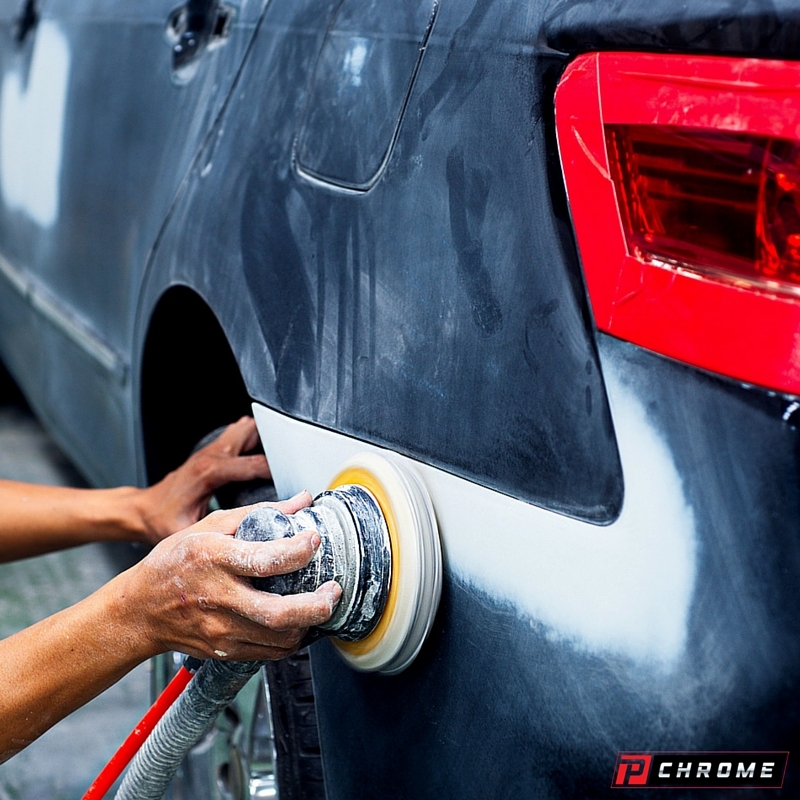 When your car’s paint is starting to look faded and worn, you can completely change its appearance by painting your car with PChrome spray-on chrome. Chroming your vehicle can give it that lustrous shine that will make it stand out. If you choose to paint a car with spray on chrome, you’ll want to follow these steps in order to get the results you’re looking for. Before you start, you need to make sure you have all of the materials gathered together. When you’re choosing your kit, make sure to purchase a PChrome Professional Starter Kit that is large enough to give you sufficient coverage. You’ll also want to make certain that you have a source of filtered dry compressed air that provides you with 5 cubic feet of air each minute with between 60 to 70 psi. The compressed air is needed to metalize the chemicals contained in your spray-on chrome, to spray your protective coatings and to dry the layers between the steps in spray chroming your vehicle. It is very important that the air you use is clean so that contaminants won’t show through your finished chrome. Make sure that the area in your shop where you will be chroming your vehicle has good ventilation with a strong exhaust fan. You must use deionized or distilled water to prevent water spots in your PChrome finish. Tap water has minerals that can cause such things as brown color deposits. Keep your PChrome kit stored away in a dark, dry and cool area until you are ready to use it. Other needed materials include 1200- to 2000-grit sandpaper, a sander, a buffer, masking tape and newspaper. To begin, you will want to remove any surface rust from your vehicle. Sand the car using your sander and sandpaper. To achieve the best results, sand the vehicle down to its bare metal. You should sand using circular motions, and expect it to take around 2 hours for each panel. When you are finished sanding, use thinners and clean rags to wipe down the whole surface of your vehicle to remove dust and debris. Clean your shop to also rid it of dust left from the sanding. After you have sanded your vehicle and removed all of the dust, the next step is applying your primer. Begin by using masking tape and newsprint to cover any areas you do not want to chrome. Mix your primer with the thinners according to the instructions provided with your PChrome kit. Spray on your primer starting with the roof and working your way down. You will want to spray the primer on in even, thin coats. It normally will take around three coats to cover your entire vehicle. The coats will have an application time of approximately 10 minutes for each panel of your vehicle. You will need to allow the coats to cure for up to an hour before you apply successive coats. When the primer dries, you will then need to sand it so that it is smooth and even. Finish by wiping it down with clean rags to remove the dust from sanding, clean your area and apply clear lacquer sealant to the entire vehicle with your spray gun. You will start by applying your base coat, which involves following a two-step application process. You will need to mix your 2KA and your 2KB, which are your basecoat and hardener, together in equal parts. Since the mixture will only last about one hour, mix just enough that you can use it up during that time. After an hour passes, you will need to dispose of any leftover mix. Apply it in a fine spray, again beginning with the roof of your car and working your way down. At 75 degrees, it will take 24 hours for the base coat to completely cure. After the base coat is cured, sensitize its surface using your PChrome W solution. Then, spray on the PChrome D solution to the entire surface, working your way up from the bottom to the top. After you have applied your PChrome D, you need to rinse off your car using deionized water. Then, apply more sensitizer followed by PChrome D again, rinsing thoroughly afterward. Don’t allow the surface of your car to dry before applying your chrome. 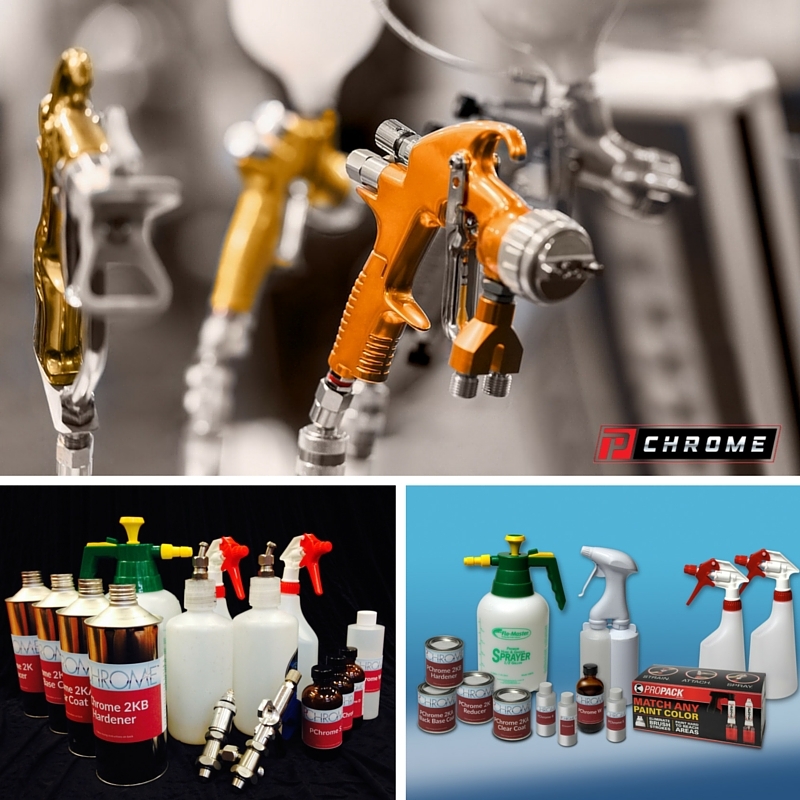 Make sure to fill your PChrome spray gun with your prepared mixtures. It is best if the deionized water that you use is between 80 and 85 degrees. Then, spray your car working your way from the bottom up and using quick, back-and-forth motions. After you have applied this layer, blow off any leftover water droplets that you see and then allow it to completely dry. For your top coat, mix your 2KA and 2KB solutions in equal parts and then add your reducer to reduce them by 20 percent. You will want to add 1 milliliter of violet for each 125 milliliters of 2K mixture that you use so it won’t have a yellowing effect. Apply your top coat using light passes until your vehicle is fully covered. If you want, you can apply a second top coat after allowing the first one to dry for about 48 hours. Finish the process by cleaning up your spray gun and your shop. You can then tell all of your friends that you learned how to paint a car with spray on chrome all by yourself when they admire your handiwork. You can purchase your spray chrome kit today. If you have any questions, give us a call. *Using spray chrome on vehicles may be illegal in some states or only allowed for show vehicles.